Regular stretching helps you improve and maintain flexibility. In turn, flexibility is important in maintaining healthy joints with a full range of motion. Many exercises can be performed with a foam roller to enhance a stretching routine. The foam roller can help target specific muscles and tissues. As an example, the pecs and anterior chest are commonly areas of significant muscle and tissue tightness. This tightness often exacerbated by, or directly the result of, the common chronic position people often find themselves in as they hunch over their desks and computers. 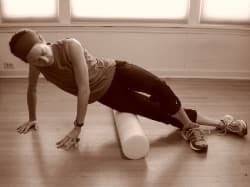 You can achieve a great pec stretch while lying down with a foam roller underneath you along the length of your spine. Once in this position, bend your elbows to about a 90 degree angle and bring them to be level with your shoulders while letting your hands gently drop back towards the floor. This position can be held for your usual passive stretch duration and repeated. Another example involves the shoulders which can be targeted more specifically by going on hands and knees with one hand on the roll. With the foam roll at various angles to your body on different sets, allow it to slowly roll up your arm as you reach ahead of you or out to the side. Foam roller exercises can also be help in increasing the mobility of a stiff back. This can be achieved by rolling back and forth or side to side over a full round foam roller with the roller either parallel or perpendicular to the spine. The rolling should be focused on the stiffer areas, usually the thoracic or mid spine. Your physical therapist can tell you your specific areas that need targeting. Ensure that you do not experience sharp pains while using this technique. If you do, discontinue targeting the offending area. In addition to rolling over stiff spinal segments, other movements can be performed to improve spinal mobility. On good example is alternate arm raises while lying on a half or full roll with the roll vertically along your spine. Place your head on one end of the roll and raise one straightened arm straight up so that your elbow is beside your ear. At the same time move the other straightened arm down along side your body. Alternate this movement slowly. There are many more ways that the roll can be used to stretch tight muscles and tissues and to improve mobility. 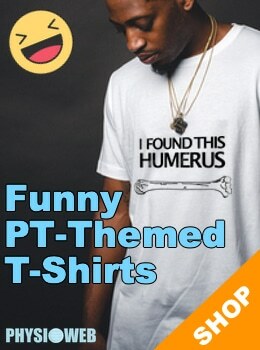 For a routine aimed at addressing your unique needs you should see your physical therapist. In addition to the more typical uses for muscle massage and stretching, foam rollers are often incorporated into exercise programs to enhance balance and strength. It is common for physical therapists to prescribe exercises that are to be performed on unstable surfaces such as on wobble boards Bosu balls (add description). The foam roller is another piece of equipment that can be used for this purpose. Performing exercises while standing on an unstable surface helps to improve overall balance, sport specific movements and also improve core strength. In additional to working the main muscles being targeted in the exercise, the deep muscles of both the abdomen and back are also required in order to maintain balance. There are many progressions that can be used when exercising with a foam roller. Less advanced exercises can involve simply doing bridging with your feet on the roll. Bridging is an exercise that is performed by lying on your back with your knees bent. The bridging part comes in when you push through your feet and lift your hips and torso off of the floor while keeping your head and shoulders on the floor. Initial progressions from the standard floor bridge include bridging with your feet on a half roll, bridging with your feet on a full roll and then on to single leg bridging (only one foot on the roll with the other leg extended straight out) and then to standing on the roll. Free weight exercises such as bicep curls are often performed while balancing in standing on a roll. On the even more advanced end of the spectrum are barbell squats while standing on a foam roll. Sports performance can dramatically improve by performing exercises and sport specific movements on the unstable surface of a foam roller. To make these activities even more beneficial, try using the foam roll to stretch and massage affected muscles first and then perform the movements on the roll using the newly pliable and lengthened muscles. Foam rollers are inexpensive and can be very effective tools in reducing pain due to muscle imbalances and tightens as well as in improving flexibility and core strength. Simply rolling over the tender areas in your muscles for a few minutes a day is a great way to increase and maintain your musculoskeletal health. When used in a proper exercise regimen they can help improve your sports performance as well. While you can achieve very effective deep muscle massage with proper use of a foam roller it is not a replacement for proper treatment from a registered massage therapist. For best results you may want to consult your physical therapist for a proper assessment and prescription of a suitable exercise program. My performance in volleyball games have improved in sense that my muscles feel less sore. I was able to identify trigger points by foam rolling and it also has helped in muscle balance. They are now a part of the post-training regimen of our team. So, what “toxins” are lying dormant in people’s muscles? Arsenic? Mercury? Agent Orange? Foam roller exercise seems exciting , nicely explained I hope it will be nice for doing as well.